This topic concerns a potential SAFETY issue so is a bit more involved as it is important that everyone understands the situation. I have 5 1/2-year-old 12R Michelin XZE tires on our coach. No cracking, and have performed well. I found sidewall 'bumps' (Tire Center gent, said they're not 'bulges', as they're so slight). One maybe 3/32" of a protrusion, the other much less. The gent said they could be belts that are misplaced or broken. But he also said the XZE's have a thicker sidewall, and that the outer layer of the tire could have separated. I know it's hard to give advice based upon a description, but I wanted to ask your thoughts on the opinion given to me by this tire gent. He suggested that I monitor the size of the 'bumps' daily, and if they don't grow, he felt that they were safe to drive on. He commented that the tire was so overrated for what it was carrying weight-wise on my RV, that it was not working hard. I've always thought that once a tire starts to break down, it was at risk for a catastrophic failure? The tire was not unmounted for inspection, but if it was an outer layer separation, as he said it could be, how would they be able to see this? Opinion? At 5 1/2 years of age, is it worth even considering monitoring and watching for growth? Or just replace and move on? First off, I do not feel that sidewall "bumps," "bulges" or "protrusions" occur because of misplaced or broken belts. Belts are under the tread not on the sidewall so I have to wonder what training, if any, the "gent" at the tire store has received on tire construction or inspection procedures. Also not sure what he is talking about as the "outer layer" of the sidewall. In a truck tire there is basically the thin innerliner (a bit like having a tube as part of the tire), then body ply, then the sidewall. So, if he thinks the sidewall has separated, then the tire has failed and should be replaced. Now, some fact-based observations on sidewall bulges or outward protrusion vs. depressions that are inward toward the air chamber and are indications of two completely different causes. The inward depressions can occur once or twice around almost any radial tire. If you take a close look in full sunlight of smooth sidewall tires you will see depressions that might be about 1/16" deep and 1/4" to 1/2" wide in the circumferential direction. These are caused by the lap splice of body ply material that provides more resistance to the slight growth seen in all radials due to inflation. These depressions will run a radial direction from the wheel to the tread and seem to disappear as you get near the tread or near the wheel. These are normal and I would only consider them minor cosmetic features of a tire. An outward bulge may be 1/2" or as large as a couple of inches in the circumferential direction. The larger or more distinct, the more concerned I would be about the durability of the tire. Usually bulges are the result of some impact damage done to the body cords that resulted in a few being broken due to shock loading. Here is a blog post I did with pictures of bulges and depressions to help people understand. Here is a post on an Impact Failure I had on my personal car. Now on some with small features, the eye plays tricks as to it being a bulge out or a depression in. I have even seen instances of two depressions being close together such that the normal sidewall between the depressions gave the appearance of being a depression. The simple tool to use is a ruler or straight edge and to lay it across the area of interest. This will quickly identify if you have a bulge or depression. Review my blog posts above. You might also find a different dealer. A simple Google for "Truck Tire Dealer Town" where "Town" is a nearby larger community, should give you a number of options. For 19.5 and larger size tires I would only deal with a Heavy truck Center. You might also contact Michelin at their Customer Contact on their RV tire page for a suggested location with people sufficiently trained in tire inspection to pass judgment on your tires. You can tell them that you're not happy with the inspection you got from the tire guy as they don't seem to understand the basics of rtuck tire construction. Am I reading Load & Inflation tables correctly? Tireman, Here is some information on my Toyo 265/75R22.5 LR-G tires. Can you confirm I am reading the tables correctly? Right side has Refer. There isn’t anything in the bays (not all the way through bays) that I could possibly switch around for even distribution so I have to go with the heavier weight. I’m thinking 100 psi for the front. What would my rears be with a fudge factor? First off , I have to thank you for providing the information on your specific tires and your actual tire loads for each end of your axles. I prefer data to guessing. With 4,750# on the heavy end of the front axle we see that 95 psi can support 4,805 so that would be the MINIMUM Cold Inflation Pressure for your fronts (remember all tires on an axle should have the same CIP) and I suggest you add 10% (10 psi) cushion to get 105 psi CIP on the fronts. The rears are dual, so looking at those inflations. 9,000 divided by 2 gives 4,500# per tire, with the 90 psi being the minimum inflation needed to support the measured load. Adding 10% or 9 psi gives us a suggested 99 psi. 100 is easier to remember and measure so lets go with 100 CIP on each of the 4 rear tires. Comment: Please always adjust inflation up and avoid going down no matter how close the weights are. Got an email stating the writer was concerned and a bit confused on the Maximum inflation a tire can have. He had heard about people having "Blowouts" and after installing a new TPMS and seeing the pressure increase was concerned his tires might explode. I can understand the confusion as people read the tire sidewall and in some cases see the words 'Max Inflation". This is NOT the max operating inflation but in reality is the inflation needed to support the max load the tire is rated for. It is also important to remember that unless a tire engineer is specifically talking about "hot inflation" we are talking about the "Cold" tire inflation when the tire has not been warmed by either running or being in direct sunlight over the previous couple of hours. Technically this means the tire is the same temperature as the surrounding air or "AMBIENT" temperature. I previously covered the effect of temperature on tire pressure and the "Ideal Gas law" so we know that for each change in temperature of 10F the tire pressure will change by about 2%. This means that when the tire temperature increases by about 50F we can expect the pressure to also change by about 10%. We need to remember that the TPMS sensor is being cooled by outside moving air so the hot spot on the tire is actually much warmer than the indicated temperature. This is one reason why we many times see pressure increase by 15% or more. True tire "Blowouts" are usually caused by too low a pressure which flexes the tire sidewall and results in fatigue failure of the steel body cord or melting of the Polyester cord in LT, P, or ST type tires. The separation of the tread and belts is sometimes mislabeled a "Blowout" which leads to confusion. Separations have a different cause than simple loss of air pressure. Back to the original question. Tires are designed to handle significant increase in pressure, most in the range of 200% of the pressure marked on the tire sidewall. BOTTOM LINE Always ensure your tires are properly inflated and the use of a TPMS is, in my opinion, the best way to not be surprised by a puncture or air leak. 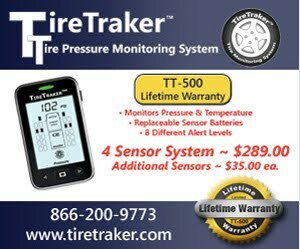 Got this question: "Tireman, I would like your opinion as to what would be good alert values to set in the TPMS on my trailer. I need to set high and low pressures and temperature alerts." First lets be clear that Trailer Cold Inflation Pressures and Motorhome and Tow vehicle CIP are established differently. While I have covered the specifics and the Why for each application in other posts, I will summarize here. 1. Both trailers and motorhomes need to confirm the actual load on their tires by getting on a truck stop scale or similar when the RV is fully loaded. 2.Using the Load & Inflation tables published by tire companies we should all learn the MINIMUM inflation needed to support the measured load for each tire. 4. CIP for Trailers is the the pressure on the tire sidewall. 5. The Low pressure alert for Motorhomes and Trailers should be the MINIMUM inflation needed to support the measured load. 6. Trailer tires should not be loaded morer than 85% of the "Max Load" as molded on the tire sidewall. 7. Most TPMS come set with the max temperature warning at 70°C ( 158°F) which is just fine. 8. Based on input from many RV owners with TPM I would suggest the High Pressure warning be at least 25% higher than the CIP.